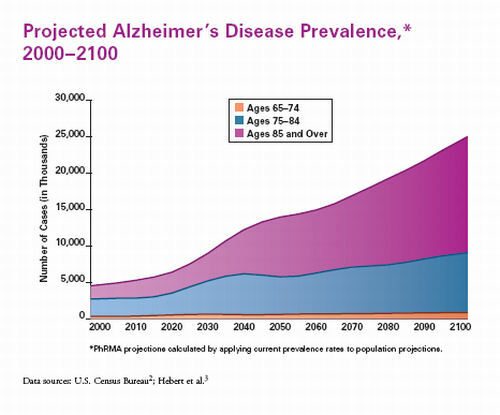 One out of two people at the age of 85 develop Alzheimer’s disease. Alzheimer’s is neurodegenerative disease that starts with short-term memory loss and mood swings, it progresses up to a point where somebody doesn’t recognize his wife or kids anymore and eventually leads to death. The prevalence of Alzheimer’s is rising. It is predicted that by 2050 about 115 million people will suffer from it, and it is not only because we get older, as more people under 85 develop Alzheimer’s more frequently. However, Alzheimer’s should NOT be part of normal aging, as Dr. Samuel Cohen, researcher for neurodegenerative diseases, explains in his Ted Talk. Unfortunately, unlike almost every other disease we haven’t made much progress in treating this disease since Alois Alzheimer’s discovered it in 1901. Dr. Dale Bredesen, author of book “The End of Alzheimer’s” explains, there are at least 36 different factors contributing to the development of Alzheimer’s and finding a drug against all these factors is very unlikely. If you have ever read something about Alzheimer’s Disease you might know that one hallmark of Alzheimer’s is the accumulation of amyloid-ß peptides in the brain. The amyloid-ß prevents the signaling between the neurons when it accumulates outside of the cells and amyloid-ß further induces inflammation which damages the surrounding neurons. However, amyloid-ß is not the cause of Alzheimer’s but acts much more like a mediator. Scientist think that the formation of amyloid-ß is likely a protective mechanism and is therefore a response to something and is therefore a response to some threat, which further increases inflammation. You might have heard about the Blood-Brain Barrier, which consists of a tight layer of cells that keep everything outside that would somehow threat the brain. And here is where the microbiome comes in. One molecule that is found on the cell wall of many bacterial species is called lipopolysaccharide, or short LPS. It binds to receptors and initiate the release of pro-inflammatory proteins. However, a healthy gut should prevent bacteria to reach our blood stream and be recognized by immune cells. But unfortunately, if somebody suffers from something that is commonly known as leaky gut, his or her gut wall became permeable to bacteria and bacterial toxins. Since there is so much evidence that connects the microbiome with the health of the brain, the next step would obviously to test whether an improvement in gut health can prevent or even reverse Alzheimer’s Disease, and this is exactly what a study published in 2016 did. As I mentioned in the beginning, there are other types of Alzheimer’s Disease that might caused by glucotoxicity, hormonal imbalances or toxins. However, a healthy microbiome can also influence those factors, as it is important for blood sugar control, the production of hormones and for the clearance of potential toxins.